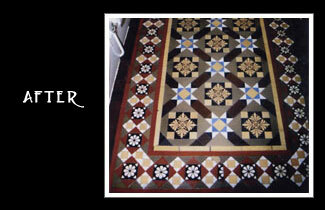 Tiled Perfection offer a range of OLDE ENGLISH™ brand geometric & encaustic tiles. The Olde English geometric tile collection has been created with versatility in mind. Recreate a period look. Modernise an old design or develop a pattern your very own. A fantastic range of colours offers the opportunity to create exciting and unique floors for every setting, whether interior or exterior. Download latest tile brochure now. The Olde English Tile collection comes in 25 different colours and up to 15 different shapes. Below are merely just some examples of the many patterns that can be created using the Olde English Tile collection. To see entire collection simply download catalog. a wider rectangle should be cut from a 150mm square to replace the 25mm wide rectangle shown below. 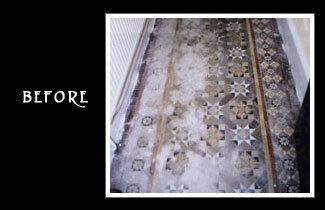 These floors (sometimes referred to as tessellated floors) were featured in entrance halls and on front paths of houses (and many commercial premises) from mid -Victorian times up to the 1930's. Designs are made up of triangles, squares, trapeziums, hexagons and octagons in a variety of colours. Often included in the designs are encaustic tiles, which are usually (but not always) square tiles, with a pattern embossed on them in layers of different coloured clay. Most often these are in two colours, but can be found in three, four or even five colours. Although these floors are long lasting, some are now showing signs of wear and tear. Restoration is normally possible. We can supply replacement plain tiles in 25 colour shades, together with reproduction encaustic tiles and cleaning and sealing products. These are true encaustic tiles and like all Olde English tiles are fully vitrified. Unlike some printed or painted tiles, these encaustic tiles will not wear out in a few years. Encaustic tiles can be incorporated in most of the designs in this catalogue, either as part of pattern repeats or as central features or corners. The encaustic tile manufacture process uses thin layers of coloured clay and this can result in some shade differences when compared to equivalent colours in the plain tile range. For colour chart, availability by tile shape & size, and to see the entire collection - download catalog at top of this page.